After leaving our lovely Connection bus at Hervey Bay, we boarded the ferry to Fraser Island. We stayed at Kingfisher Bay Resort in Lodges where we had our own room but we had to share bathrooms. We were very secluded at our resort so luckily there was a bar! Both evenings were spent at the Dingo bar playing drinking games as a group. In the day, most of the group went out on a 4x4 tour of the island which just left 7 of us behind. We spent time around the pool in the morning and then in the afternoon we split the cost of hiring a 9 seater 4x4, which worked out really cheap. 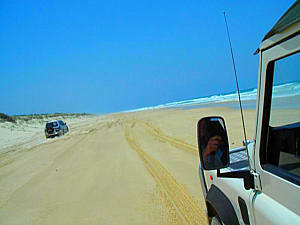 We explored the island which was a pretty rough ride on all sand tracks but a great laugh! We drove down the beach highway which was amazing and then onto a beautiful place- Lake McKenzie. It had perfect white sands and clear fresh waters. Although very cold, we all had a dip! We finished the day by watching the sunset at the pier with a glass of wine.